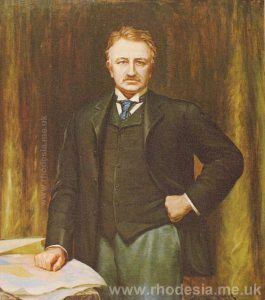 The portrait of Cecil John Rhodes by Sydney P. Kendrick which hangs in the entrance hall of the House of Assembly. “Parliament is not a congress of ambassadors from different and hostile interests; which interests each must maintain, as an agent and advocate, against other agents and advocates; but parliament is a deliberative assembly of one nation, with one interest, that of the whole; where, not local purposes, not local prejudices ought to guide, but the general good, resulting from the general reason of the whole. You choose a member indeed; but when you have chosen him, he is not a member of Bristol, but he is a member of parliament.“. “Pursuant to Proclamation of His Excellency the Governor, No. 5, the members elected to serve in the House of Assembly met in the Assembly Chamber at 10 o’clock a.m.” The date was Friday, 30th May, 1924, and marked the opening of the First Session of the First Parliament of Rhodesia. The venue was not the present Parliament Building, which since 1899 had been the meeting place of the Legislative Council, the forerunner to Parliament. 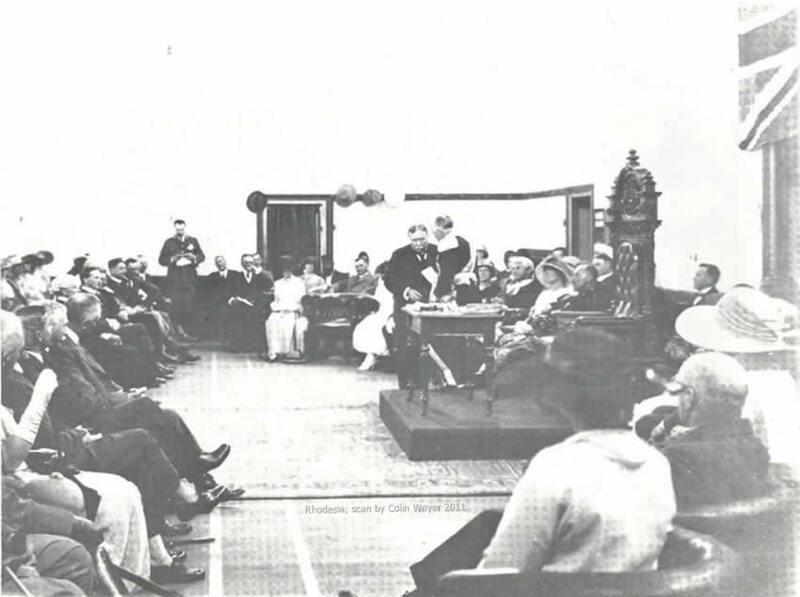 In order to accommodate the vast number of spectators and guests the newly completed Meikle’s Hall on the corner of Third Street and Speke Avenue had been taken over for the ceremony. 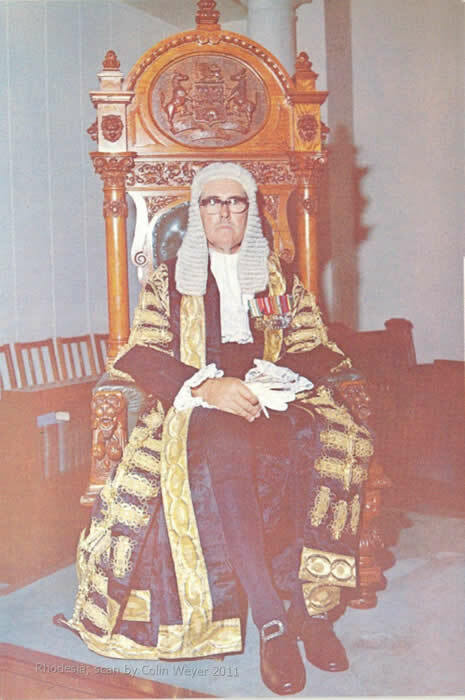 After the Clerk of the House had read the Proclamation, twenty-nine of the thirty recently elected members took the Oath of Allegiance which was administered by the Senior Judge of the High Court, Sir Clarkson Tredgold. The House then proceeded to the election of the first Speaker ever to hold office in Rhodesia. On the motion of the Premier, Sir Charles Coghlan, seconded by Sir Ernest Montagu, Mr. Lionel Cripps, a former member of “A” Troop of the Occupation Column and the first person to peg the Jumbo Mine in 1891, was unanimously elected. Business was then suspended until twelve o’clock noon when the first Governor, His Excellency Sir John Chancellor, K.C.M.G., D.S.O. arrived to deliver the opening speech, in the course of which he reviewed exhaustively the Colony’s position and said: “This occasion of to-day, as you must all realise, is no mere annual ceremony; it will form a landmark in our history, and will, I trust, leave a lasting impression on the memories of all present”. “There was a distinguished gathering in the Assembly Chamber long before the hour set down for the opening of Parliament. The main entrance doors in Third Street were opened to the public at 11 o’clock, and for some time before that hour an extensive queue of people drawn from all parts of the country, even from remote districts, was patiently waiting for admission. The hall was a blaze of colour. Festoons of streamers and pennants swung overhead from side to side of the building, and as the seats were rapidly occupied the fashionable dresses worn by the numerous ladies present enhanced the effectiveness of the colour scheme. In a few minutes the main body of the hall was filled to its utmost capacity and many late-comers were obliged to stand in the aisles at each side of the seats. There was a buzz of animated conversation which was, however, stilled from time to time as the Arnold-Quin Quartet orchestra delighted everyone with fascinating musical selections. The presence of the orchestra was a distinct and novel innovation into such an august assembly. 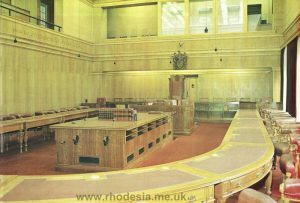 Was it any more novel than the fact that the first Rhodesian Parliament should have been opened in an attractive hall on licensed premises? These two features were signally and typically Rhodesian, and even the presence of a gang of native convicts under the supervision of white and native warders armed with rifles, who assisted in placing chairs for the accommodation of the spectators, which would have created a mild sensation elsewhere, called for nothing more than passing comment. In addition to the main floor of the hall, the gallery and the stage behind the Governor’s dais was thronged, and one corner of the gallery was reserved for coloured people, all on the tip-toe of expectancy. It was truly a Rhodesian gathering, possessing a fine sense of decorum, but not sufficiently trained to the dignities of procedure to refrain from applauding a particularly striking number by the orchestra, and equally lacking in restraint-who would have had it otherwise?-when the popular Prime Minister, accompanied by Lady Coghlan and their daughter, passed along the centre aisle to take their seats. Cheers were raised in no half-hearted fashion when Sir Charles was first glimpsed by the keen observers in the gallery, and the compliment was smilingly acknowledged by the first Premier of the country. Other members were also warmly welcomed by the good-humoured crowd. LETTERS PATENT providing for the constitution of Responsible Government in the Colony of Southern Rhodesia. George the Fifth by the Grace of God of the United Kingdom of Great Britain and Ireland and of the British Dominions beyond the Seas, King, Defender of the Faith, Emperor of India, unto all to whom these presents shall come Greeting. 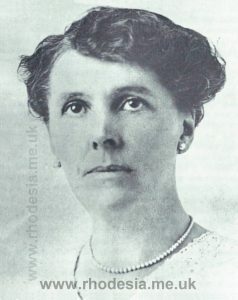 Mrs. Ethel Tawse Jollie, first woman member. The opening of the First Session of the First Parliament of Southern Rhodesia, 30th May, 1924. Reproduction of painting presented to the House of Assembly by the Meikle family, 21st May, 1974. 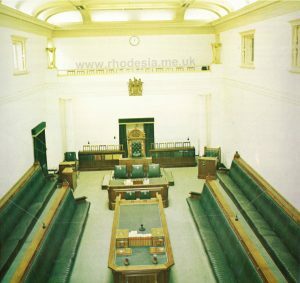 The first semblance of a representative institution in Rhodesia is to be found in the Legislative Council, established in terms of the Southern Rhodesia Order in Council 1898. 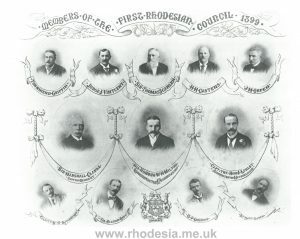 This Council, which had no executive responsibilities, consisted of the Administrator of Mashonaland, His Honour W. H. Milton, as President, the Administrator of Matabeleland (these offices were merged in 1901), the Resident Commissioner, as representative of the British Government but without a vote, five senior officials of the British South Africa Company nominated by the Company with the approval of the British Secretary of State for the Colonies, and four members elected by the persons enrolled on the voters roll. This was the first bold step towards what was to mature twenty-five years later as responsible government. According to contemporary reports the elections were fought with great gusto, with many acrimonious personal attacks by the candidates on each other as there were few policy differences between them. The ill-feeling engendered by the elections reached a climax when one of the defeated candidates, W. E. Fairbridge, at that time Mayor of Salisbury, accused Colonel Raleigh Grey, who had been elected to the Council to represent the voters of Mashonaland, of corrupt and illegal practices during the election. After an action in the High Court, Grey was found to be innocent and Fairbridge resigned as Mayor. Although the Rhodesian voters were now represented in the Legislative Council, which met for the first time on the 15th May, 1899, their four members were quite insufficient to sway any decision. The administration of the country and executive power remained in the hands of the British South Africa Company in terms of its Charter of 1889. The Company, as a commercial concern, had to take into account the interests of its shareholders which did not necessarily coincide with the interests of Rhodesians. Moreover the British Government retained over-all control of legislative measures in the form of disallowance and non-assent. In addition, the High Commissioner for South Africa had the power to legislate by proclamation and did so in at least one instance despite the opposition of the Administration. The Order in Council of 1898, besides constituting the Legislative Council, had made provision for a resident commissioner to be stationed in Rhodesia to represent the British Government. As a member of both the Executive and Legislative Councils he was closely in touch with all matters of administration, and was in fact the watch-dog of the British Government. His position was a strong one as his views were heeded by the Colonial Office, and he could almost be said to have possessed a power of veto over legislation. Over the years the grievances of the Rhodesian pioneers and settlers against the British South Africa Company accumulated. The British Colonial Office, concerned chiefly in protecting the interests of the British taxpayer, refused in general to take sides and was principally concerned to avoid future British financial commitments. In the first session of the Legislative Council the four elected members found themselves in frequent opposition to the nominated members representing the Company. A movement was soon under way to increase the number of elected members. Eventually an agreement was reached and by an amending Order in Council in 1903 the membership of the Council was increased to seven elected and seven nominated members. At the same time the Administrator lost his deliberative vote but retained a casting vote. Dissatisfaction nevertheless continued, and as early as 1907 a motion was debated by the Council requesting the establishment of responsible government. Shortly afterwards the Company bowed to public pressure and agreed to limit the nominated members to five. This agreement was finally ratified by an Order in Council in 1911 whereby the elected members achieved an over-all majority. They still, however, had no representative on the Executive Council which was completely independent of the Legislative Council. Moreover, the members of the Executive Council could not be removed from office by an adverse vote in the Legislative Council. In 1914 the British Government issued an extremely important Supplementary Charter which laid open the path to responsible government. This Charter, however, was completely overshadowed by the outbreak of the First World War, and before the war was over, new considerations had entered the sphere of politics both in Britain and Rhodesia. The possibility of an amalgamation between Southern and Northern Rhodesia was mooted, and even greater persuasions were made for Rhodesia to enter the Union of South Africa. This latter course was strongly supported by the Colonial Office on the grounds that the Company’s vast financial claims would then have to be met by the South African Government, thus effecting a saving for the British taxpayer. The Royal Charter establishing the British South Africa Company in 1889. Sir John Chancellor, the first Governor, administering the oath to Sir Charles Coghlan, the first Prime Minister, in October 1923. 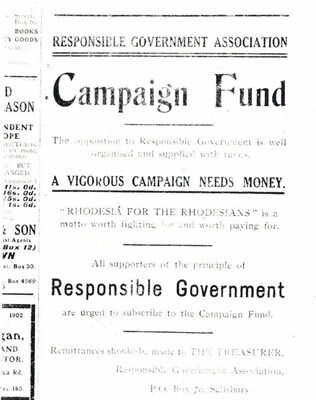 Among Rhodesians the movement for responsible government grew stronger, and the Responsible Government League was formed. Led by Sir Charles Coghlan, who had been an elected member of the Legislative Council since 1908, this body was strongly opposed by the Rhodesia Union Association, which favoured incorporation in the Union of South Africa. By 1920 the number of elected members in the Legislative Council had been increased to thirteen, and in the general election of that year the issue of responsible government as opposed to joining South Africa was fiercely canvassed throughout the country, each side contesting every seat. The result was decisive. The Responsible Government League won twelve out of the thirteen seats, and at the first session of the newly elected Council Coghlan was successful in carrying a resolution by twelve votes to five in favour of the establishment of responsible government. In the following year Coghlan led a delegation to London to interview the recently appointed Colonial Secretary, Winston Churchill. Churchill strongly supported Rhodesia’s entry into the Union, and General Smuts, the South African Prime Minister, offered tempting terms for incorporation including a seat for Coghlan in the South African Cabinet. Coghlan never wavered. 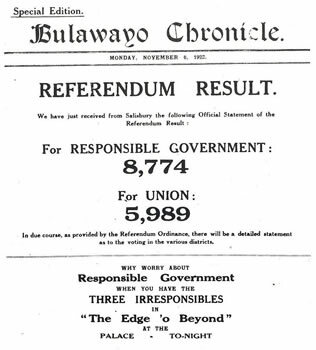 He and his supporters campaigned vigorously throughout the country with the result that when a referendum was held on the 27th October, 1922, on the issue of responsible government versus joining South Africa, 8 774 votes were recorded for Coghlan and 5 989 for the Unionists. 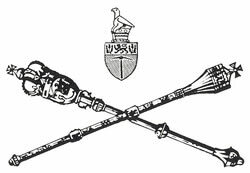 The following year administration by the British South Africa Company, under the Royal Charter and the protection of the Crown, ended. The country was annexed to and became part of His Majesty’s Dominions as a Crown Colony with responsible government, by virtue of the Southern Rhodesia (Annexation) Order in Council of 1923, as read with Letters Patent dated the 1st September, 1923, which provided for the 1923 Constitution. The debating chamber of the House of Assembly, from Mr. Speaker’s Gallery looking towards the Speaker’s Chair, with the Press Gallery above. The essential attribute of responsible government consists of the requirement that the Government of the day is responsible and accountable to an elected assembly of members, and that if it loses the confidence of a majority of the elected assembly it must either resign or dissolve the assembly and call a general election. This is the collective responsibility of the government as a body. In addition, individual ministers of government are responsible and accountable to the assembly for their official actions and for the administration of the departments of state under their control. These features require, therefore, that the ministers who compose the government must be members of the legislature. This in many ways is an advantage to Government. A Minister who is criticised has the right to reply. Writing of the events which followed the outbreak of war in 1914 and the criticism in the press of his administration of the Admiralty, Churchill has stated: “No attack in the House of Commons gave me the opportunity of defending myself”. (Churchill has also stated: “I do not resent criticism even when, for the sake of emphasis, it parts for a time with reality”- House of Commons, 22 Jan. 1941). The 1923 Constitution made provision for a Legislative Assembly consisting of thirty members. For the first election the registered voters were divided into fifteen electoral districts. The voters’ qualifications were based on the existing electoral laws in force. Provision was also made for the Legislature to pass a law to constitute a second chamber to be designated the Legislative Council, which together with the Legislative Assembly would constitute the Legislature. This latter provision was never implemented during the operation of the 1923 Constitution, and the Legislative Assembly remained the Legislature for all purposes of the Constitution. Provision was made for the election of a presiding officer for the Legislative Assembly to be designated the Speaker, who was not required to be a member of the Assembly. The Legislature was given power, subject to the provisions of the Constitution, “to make all laws, to be entitled ‘Acts’ which shall be required for the peace, order and good government of the Colony”. The Governor was empowered to appoint such officers as he thought fit, not exceeding six in number, to be Ministers, one of whom would be designated as Head of the Ministry and styled the Premier (this designation was subsequently altered to Prime Minister). The Governor was further to assign to each Minister the headship of such department or departments as he thought fit. 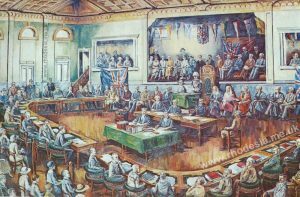 After the first general election of Members of the Legislative Assembly no Minister was to hold office for a longer period than four months unless he was or became a Member of either House of the Legislature. The President of the Senate’s procession led by the Deputy Principal Doorkeeper (Senate) followed by the Serjeant-at-Arms, Mr President and the Secretaries at the Table. Mr. Speaker’s procession led by the Deputy Principal Doorkeeper followed by the Serjeant-at-Arms, Mr. Speaker, and the Secretaries at the Table. The procedure of the new Legislative Assembly was broadly based on that of the British House of Commons, with those alterations made necessary by its much smaller size. In particular, the traditions and customs surrounding the office of Speaker have been closely followed. Rhodesia has been fortunate in having a succession of Speakers who have upheld the great traditions of impartiality and independence during their tenure of office. The Speaker, who has been described as the interpreter and custodian of the rights and privileges of the Members of the House, has duties which are as various as they are important. Each day when the House is sitting the Speaker, clad in wig and gown, walks in procession to the Chair in the debating chamber. 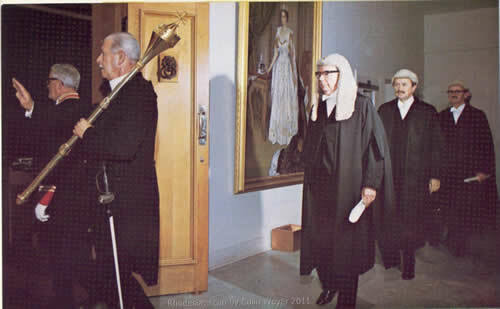 This procession consists of the Principal Doorkeeper, the Serjeant-at-Arms carrying the Mace on his right shoulder, the Speaker and the Secretaries at the Table, who are the senior officers of Parliament. After bowing to Members on either side of the House, the Speaker reads prayers, and the day’s business can then begin. While in the Chair, the Speaker decides and enforces all points of order, regulates debate, calls upon Members who wish to speak, and if two or more Members rise at the same time, he decides which one should address the Chair. Certain of the Speaker’s duties relate to the rights of minorities, for the Speaker has the power to refuse to accept a motion for the closure (i.e. “That the Question be now put”) which brings debate to an end. The Standing Orders which regulate the business of the House may be suspended upon motion moved after notice, which in practice entails a day’s delay, but in cases of urgent necessity, “of which Mr. Speaker shall be the judge”, any order or orders may, with the leave of the House, be suspended upon motion moved without notice. If a Member claimed that a breach of privilege of Parliament had been committed it would rest with the Speaker to determine whether a prima facie case had been established. Further, if a Member asked leave to move “the adjournment of the House for the purpose of discussing a definite matter of urgent public importance”, the Speaker must decide, in his absolute discretion, whether the matter falls within the established rules covering motions of this type, and if he determines that it does, the motion would take precedence over the business on the Order Paper and would be debated that day. Speaker of the House of Assembly, seated in the Speaker’s chair. The Speaker has considerable disciplinary powers. If a Member’s conduct in the House were grossly disorderly the Speaker could order him to withdraw from the precincts of the House for the remainder of that day’s sitting. The Serjeant-at-Arms, who is an officer of Parliament appointed to attend upon the Speaker, would act on such orders as he received from the Speaker to ensure the Member’s withdrawal. If the Speaker considered an offence committed by a Member in the House so serious that a more drastic punishment was required he could “name” the Member. In this case the procedure is as follows: The Speaker says, “Mr. X, I have to name you for disregarding the authority of the Chair”. Whereupon the Leader of the House, who is a senior cabinet minister, or in his absence any other minister, rises and moves: “That Mr. X be suspended from the service of the House”. The Speaker forthwith puts the Question for decision, no amendment, adjournment or debate being allowed. On the motion being carried the recalcitrant Member is suspended on the first occasion in any session for four sitting days, on the second occasion for eight sitting days and on the third or any subsequent occasion for sixteen sitting days. In the case of great disorder arising, where a number of Members disregard the authority of the Chair, the Speaker is authorized by Standing Orders of the House to adjourn the House without putting any Question, or to suspend any sitting for a time to be named by him. These drastic powers are seldom used. For the most part the Speaker’s call of “Order” is quite sufficient to prevent breaches of the law and custom of Parliament. A good Speaker gains from Members what has been aptly described by Graham in “Mother of Parliaments” as the “willing acquiescence and not the reluctant submission to his decisions”. Thus a ruling by the Speaker cannot be questioned, and his conduct in the House can only be debated on a substantive motion moved after notice specifically for that purpose. In terms of the present Constitution the Speaker cannot be removed from office except by an affirmative vote of not less than two-thirds of the total membership of the House of Assembly. Moreover his salary as Speaker is charged upon and paid out of the Consolidated Revenue Fund and cannot be reduced during his continuance in office. What has been written above about the Speaker and the procedure of the House of Assembly applies equally, mutatis mutandis, to Rhodesia’s Senate and its presiding officer, the President of the Senate. Rhodesians may take great pride in the manner in which over the past half century the customs and traditions of Parliament have been maintained. On the other hand there has been no die-hard conservatism with regard to procedure. Where it is thought that improvements could be made, these have been effected. The present edition of the House of Assembly Standing Orders is the Tenth, and at each revision attempts have been successfully made to improve and streamline the procedure in the House and to omit material which served little or no useful purpose. As the leading text-book on Parliamentary Procedure by Erskine May puts it: “The true standard for measuring the relative importance of a form or rule is the extent to which it is essential or serviceable to the exercise by each House of its parliamentary functions. The 1923 Constitution was to serve Rhodesia for some thirty-eight years, and under it nine Parliaments were elected. Towards the end of this period the Federation of Southern Rhodesia, Northern Rhodesia and Nyasaland was established in 1953, and many of the more important functions of Government were transferred to it. The Federal Constitution provided initially for a Parliament, to be known as the Federal Assembly, of thirty-five Members including six Africans, two from each of the three territories, and three members with special responsibilities for African affairs. In 1958 the membership of the Federal Assembly was enlarged to fifty-nine members and the African member­ship was doubled. From the outset the Federal Assembly had close ties with the Rhodesian Parliament. 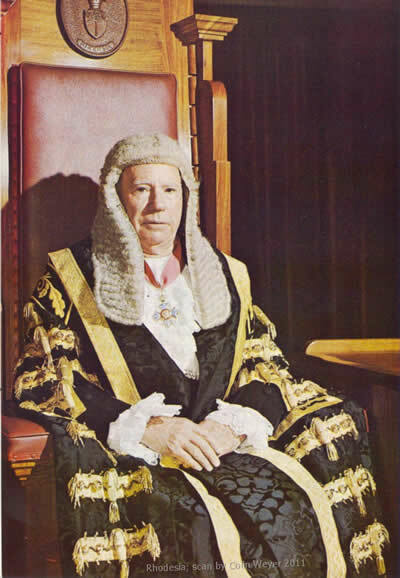 Its first series of sittings in the early part of 1954 was held in the Rhodesian Parliament and its Speaker, the late Sir Ian Wilson, had previously been Speaker of the Rhodesian Parliament. Of the Members representing Southern Rhodesia in the Federal Assembly many, including the first Federal Prime Minister, had either held office or sat in the Rhodesian House. As representative institutions were at a comparatively primitive stage in the two northern territories at the time of the establishment of Federation, it was inevitable that the customs and procedure of the Federal Assembly were closely based on those of Southern Rhodesia. Moreover, for its entire life the Federal Assembly was housed in a building adjoining the Rhodesian Parliament which today forms the first three floors of the north wing. The Federation did not survive. Despite the vehement opposition of the Federal Government, the British Government agreed in December, 1962, to allow Nyasaland to secede from the Federation, and the death blow was delivered on the 29th March, 1963, when the British Government announced that any territory would have the right to secede. The Federation was finally brought to an end by British legislation on 31st December, 1963, by which time all its functions of government had reverted to the three territories. In the meantime following a referendum a new Constitution had been granted to Rhodesia by Britain in terms of the Southern Rhodesia (Constitution) Order in Council, 1961, made on the 6th December, 1961. The major portion of the new Constitution was to come into operation on “the appointed day”, which, in effect, was the date of the dissolution of the Ninth Parliament. One of the principal provisions of the 1961 Constitution increased the membership of Parliament from thirty to sixty-five members, elected from fifty constituencies by voters on the higher, or “A” electoral roll and fifteen elected from fifteen electoral districts by voters on the lower, or “B” electoral roll. As the lower, or “B” roll consisted predominantly of Africans, this would for the fIrst time in Rhodesia’s history ensure the election of Africans to Parliament. 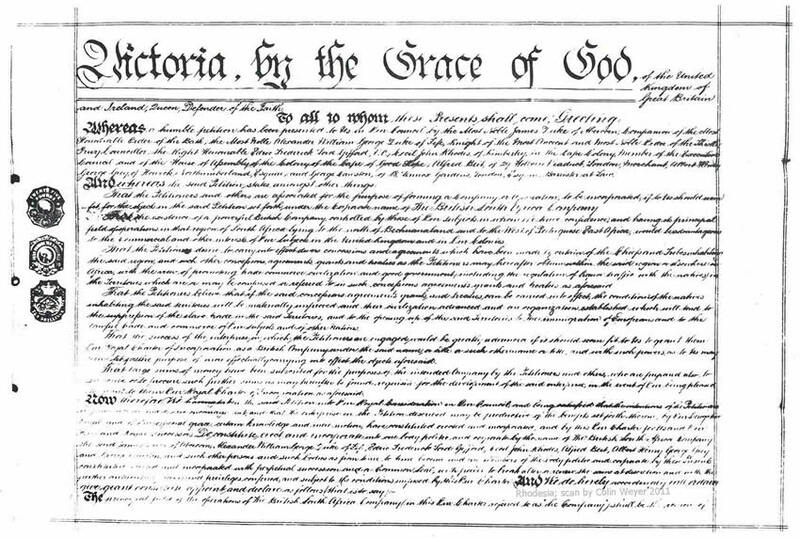 Provision was also made for a Declaration of Rights and for a Constitutional Council whose sole function was to act as the watch-dog of the people for safeguarding their rights under the Declaration by examining any bill passed by Parliament which was submitted to it or any subsidiary legislation enacted after the coming into operation of the Constitution and by reporting to Parliament whether, in its opinion, any such bill or subsidiary legislation contained any provision which was contrary to or inconsistent with any of the provisions of the Declaration of Rights. Any such law (including any subsidiary legislation) which was found by a court to be contrary to the Declaration of Rights could be pronounced. to be invalid. The Honourable J.W. Pithey, I.C.D., C.B.E., President of the Senate, seated in the President’s chair. 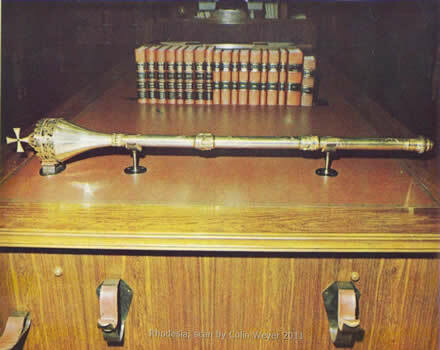 The Senate mace on the Table of the Senate. Under the new Constitution the powers of the Governor were curtailed. While his appointment continued to be made by the Sovereign on the advice of the Secretary of State, the Rhodesian Government had a constitutional right to be consulted before any name was submitted to the Queen. The Governor was required to act in accordance with the advice of his Ministers in all matters except in regard to (a) the dissolution of the Legislative Assembly; (b) the choice of the Prime Minister; and (c) the appointment of the Chairman of the Constitutional Council where he was required to act on the advice of the Chief Justice. In regard to the choice of Prime Minister and the dissolution of the Legislative Assembly, the Governor would act in accordance with his own discretion, but he was required to exercise that discretion in the same manner as the Sovereign in the United Kingdom in similar circumstances. The “reserved powers” vested in the British Secretary of State disappeared. In contrast to the position under the 1923 Constitution, the Legislative Assembly had power to amend or repeal any of the provisions of the new Constitution except those relating to the functions of the Sovereign and the functions of the Governor as the Sovereign’s representative. The power of dis-allowance by the Sovereign was retained only in respect of any act which might be inconsistent with any international obligations imposed on the Sovereign in relation to Rhodesia or which altered to the detriment of the stockholders or departed from the original contract in respect of any stock issued under the British Colonial Stock Acts by the Rhodesian Government on the London market. Such laws could be disallowed within six months of their being passed. Certain provisions of the new Constitution were, however, specially entrenched; that is to say they required a special procedure for their amendment. These provisions were those which related to the Declaration of Rights, appeals to the Privy Council, the Constitutional Council, the Judiciary and the provisions for amending the Constitution, securing civil service pensions and giving effect to the restriction on the amendment of the franchise and also provisions in regard to land. One interesting point was that whereas the 1923 Constitution made provision, as already mentioned, for the establishment of a Second Chamber, there was no such provision in the 1961 Constitution. A further important provision contained in the 1961 Constitution was that the Legislative Assembly was specially empowered to make laws having extra-­territorial effect. The legislative powers continued to be vested in the Legislative Assembly of sixty-five Members elected in accordance with the electoral law for the time being in force relating to elections. Qualifications and disqualifications of voters continued to be governed by the electoral laws of the country and the legislature had power to amend the franchise and electoral laws generally. However, any amendment of the franchise which had the effect of rendering ineligible for inclusion in the “A” Roll or the “B” Roll, as the case may be, any person who would have been entitled to be included in the Roll on the basis of the new qualifications would require for its enactment the special procedure referred to above for the entrenched clauses of the new Constitution. Reference was made earlier to the transmission of bills passed by the Legislative Assembly to the Constitutional Council. Certain categories of bills, however, were excluded from this provision in the Constitution. These were Money Bills, Bills certified by the Prime Minister to be of so urgent a nature that it was not in the public interest to delay their enactment, and Bills which amended, added to or repealed any specially entrenched provision of the Constitution or which under the provisions of the Constitution were made subject to the same procedure as if they were such bills. The debating Chamber of the Senate, looking towards the President’s chair, with the interpreters’ booths and the Press Gallery above. It will be seen from the above that the 1961 Constitution was a milestone on the path of Rhodesia’s Parliament towards full and unimpeded legislative sovereignty. From the time of the break up of the Federation the Rhodesian Government sought to negotiate independence with the British Government. These attempts failed. Britain in due course conferred independence on the two northern territories of the former Federation, which were eventually re-­named Zambia and Malawi. Rhodesia, which for forty years had enjoyed responsible government, was denied legal sovereignty. In November, 1964, the Rhodesian Government, having been empowered by an Act of Parliament, held a referendum “for the purpose of determining whether the voters of Southern Rhodesia are in favour of or against Southern Rhodesia obtaining independence on the basis of the Constitution of Southern Rhodesia, 1961.” The result left no room for doubt. 58 176 votes were cast in favour and 6 101 against. Further talks on independence were held with the British Government in October, 1965. No agreement was reached, and in a broadcast to the nation on the 11th November, 1965, the Prime Minister declared Rhodesia’s independence and announced a new Constitution, closely based upon the 1961 Constitution but without any elements of subordination to Britain. When Parliament met shortly afterwards on the 25th November, 1965, the Speaker ruled that the 1965 Constitution was valid. Subsequently, by the Constitution (Ratification) Act (No. 1 of 1966), the 1965 Constitution was duly ratified by a two-thirds majority of Parliament.